Nigeria is a tasty morsel for the termination. The country has superbly a developed range of GSM-communication services. According to preliminary data, almost half the population of 180,534,580 million people, i.e. 98 million subscribers, use mobile phones. Major GSM-operators in Nigeria are MTN, Airtel, Globacom, and Etisalat. MTN has 62.5 million subscribers (41.5% of the market), Airtel - 31.1 million people (40%), Globacom and Etisalat - approximately 5.2 million users, and covering 25% of the market. Each operator offers its tariff plans for subscribers, many of which are suitable for call+termination Nigeria. MTN offers a series of packages XS, S, M, L, XL. Airtel (Zain) offers Smart VALUE, Premier Connect N8000, SmartTRYBE and SmartTALK 2.0, etc. Globalcom presents the lineup that includes 8 Join Glo, Etisalat has Smartpaks tariff plans to offer. Many newcomers ask the question how to choose the most advantageous package. Of all the options we studied preference can be given to XS and MTN BetaTalk, as well as Smart VALUE from Airtel. One minute of the conversation costs $0.00047- $0.000479. MTN BetaTalk is advantageous as it accrues bonuses in the amount of 200%. Smart VALUE should be activated, through a set sequence of numbers: *314#. 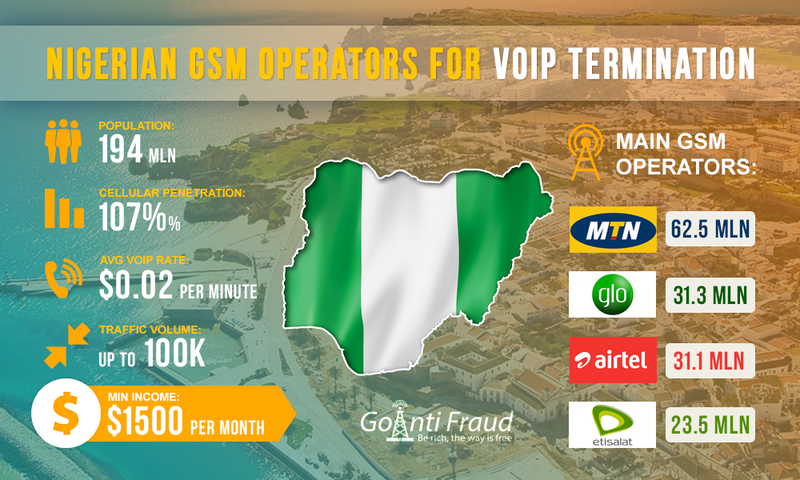 Increase your revenues from GSM termination in Nigeria, using GoAntiFraud! We provide you with proven tools to protect the SIM-cards from the lock and will render professional assistance in setting termination logic, in accordance with the characteristics of your country. By the way, experienced terminators often choose MTN packages as the operator provides generous bonuses for topping up the account. For example, by topping up the StartPack account for $ 0.32, you can get up to 500% of the extra credit. Taking into account bonuses, one minute via MTN StartPack and S packages is priced at $0.00108. You can put the M package from MTN Nigeria and Smartpaks package from Etisalat in third place. They are also beneficial for the termination. When installing the VoIP GSM gateways, a minute of conversation in the country will cost from $0.00216 to $0.0024. To connect Smartpaks, you need to pay $0.95, and then the operator will provide you with 400 minutes to make calls to Etisalat numbers. To switch to this tariff plan, you need to dial a combination of numbers *737* 0 #. Demand for traffic termination in Nigeria is quite high. If you carefully study VoIP info and apply the above packages, you can make good money on the difference in price. VoIP price per minute is $0.0233. That is, revenue per minute will range from $0.02283 to $0.0209. Terminating within 5 days in Nigeria, the terminator can make $1,000. Do you plan to invest in the GSM termination in Nigeria? You will be interested in GoAntiFraud NewBusiness offer for beginners. This is a business package that includes everything you need to work at an early stage. In addition to VoIP equipment, AntiFraud protection tools and convenient software, we provide professional technical support at all stages of your business!